Spread the Avocado Aioli on the rolls. Add the salmon burgers, top with the slaw, close the sandwiches and serve. 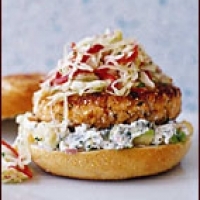 MAKE AHEAD The uncooked salmon burgers and the slaw can be refrigerated overnight. NOTES:Sambal is a condiment used in Indonesia, Malaysia, Singapore, the southern Philippines and Sri Lanka, as well as the Netherlands and in Suriname, made from a variety of peppers, although chili peppers are the most common. Sambal is used as a condiment or as a side dish, and is sometimes substituted for fresh chilis; it can be very hot for the uninitiated. It is available at exotic food markets or gourmet departments in supermarkets in numerous countries. Halve the avocados and scoop the flesh into a bowl. Add the lime juice and garlic. Mash well. Scrape into a food processor and puree. With the machine on, drizzle in the oil. Scrape the puree into a bowL. Fold in the coriander and season with salt and pepper. Refrigerate for up to 2 hours then serve with dipping bread or vegetables. This recipe replaces the raw egg in many aioli recipes with an Avocado, to acheive the creamy texture, without the risk of salmonella from uncooked eggs. Also, coriander leaves (cilantro) taste quite different to the seeds (which is what is usually referred to as coriander), so if you cannot get any, flat-leaf parsley is a good substitute. Sweet! 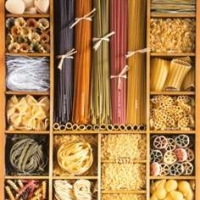 I now know what I am making this evening. I have most of the ingredients and can finish up the list on my way back for the Doc's office. Truly Marvelous! I give it a *5*. Joymarie you amaze me with this Pescatarian delight. I have also printed this one out. Nutritious and delicious all in one package.